Your neighbourhood GTA roofing contractors! 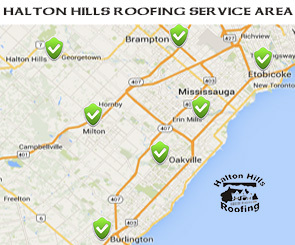 For over two decades, Halton Hills Roofing contractors have served the communities and neighbourhoods of the GTA. Serving the needs of thousands of customers, we have proudly provided our home-town and our neighbours with both residential and commercial roofing. Since we opened, our local support and expert staff has grown considerably and our expanded service areas now include Georgetown, Acton, Caledon, Hillsburgh, Orangeville, Oakville, Milton, Mississauga, Burlington, Brampton and Etobicoke. While looking for services, estimates and improvements for your roofing, Oakville residents can turn to their neighbouring city in the GTA area for reliable and full-service Oakville roofing. When it comes to top notch residential shingling, Oakville residents can call in anything from a leaky roof due to damaged shingles to a full replacement. 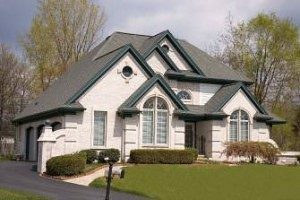 Our Oakville roofers can provide home-owners with durable asphalt residential roofing which comes in a variety of styles and colours. We can also provide long-lasting and gorgeous wooden shingles and cedar roofing. Oakville business owners looking for commercial roofing enhancements can look into our speciality products to enhance their image. Our contractors work efficiently and quickly, so you can expect us to be in and out of your way within a week. Just west of Mississauga and Lake Ontario, Halton Hills offers roofing to Mississauga residents that is both local and affordable. For residential roofing, Mississauga residents can expect our signature 50 year warranty on our materials and the 10 year warranty on our labour to ensure your costs are minimal and your quality is top notch. Mississauga business owners can find state of the art flat industrial roofing that has a competitive lifespan and high levels of energy conservation. For both commercial and pitched residential roofing, Mississauga home and business owners have available to them free roofing inspections and estimates. Our roofing contractors are prepared to help your home or commercial property plan and prepare for any necessary repairs or desired modifications. We’ll examine all of the elements involved in keep your roof up and running, including siding, gutters, roof frames, skylights and other fixtures to make the best decisions for the future of your residential or commercial roofs. Serving the community as well as the environment is important to us and for residential and commercial roofs, customers can expect ecologically conscientious efforts. This includes recycling materials as much as possible and buying only environmentally friendly and sustainable resources from our suppliers. Here in Georgetown where we started, roofing has been our contribution to our community. Halton Hills has been serving Georgetown for 26 years and counting. We continue to provide top quality service and housing to the community that we grew up in. By roofing Georgetown, we are providing roofs for our friends and family and helping secure our community’s future. When we are looking to hire our new up and coming experts in roofing, Georgetown is one of the first places we go for our next generation of team members. As you’re looking around for Georgetown roofing services, you need not look further than your own neighbourhood. For repairs and replacements in commercial and residential roofing, Georgetown can continue to expect dedicated and customized local service. Halton Hills proudly provides services to its community and neighbours, serving and roofing Burlington is no exception. Don’t let the distance mislead you—we treat you like one of our own. We provide roofing that is sturdy, secure and ready to deal with the strong winds and temperature fluctuations of the Lake Ontario cities. In our non-stop effort to provide the roofing Burlington residents need and deserve, we offer a variety of shingles— high end fibreglass asphalt, cedar, EDPM and TPO for commercial. 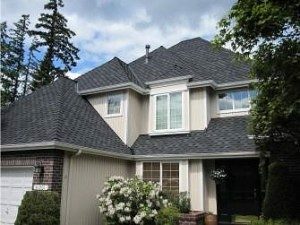 As with the other lake cities, Burlington roofing customers can expect roofing inspections, installations and knowledge from our expert staff that fully takes into account the local weather patterns and conditions. When it comes to high quality materials and service in roofing, Milton residents can expect the same dedication as the rest of the GTA area we serve. Our seasoned roofing contractors know that a sturdy, reliable roof is one of the keys to a safe and secure home. That’s one reason we offer free inspections and estimates on the costs of repaired, upgraded, or replaced roofing. Milton residents all have access to this free, informed assessment of their roofing to enable them to plan for the long-term future of their home. We’ll inspect your shingles, gutters, siding and other fixtures that could be potential breaches in your roof and help you determine the best and most affordable course of action. We work to make sure all Milton roofing is solid, reliable, leak-free and long-lasting. Staked out right around the corner in Georgetown, Halton Hills Roofing Contractors is proud to provide expansive service. Our roofing contractors are ready to provide you with free inspections and estimates. It’s important to know how to maintain your roof year round, keeping in mind the changes and potential hazards that come with the seasons. Our Etobicoke roofing experts travel to you and assess any damages, problems and potential needs for your roof and gutter system, making sure you are optimally prepared for the potential worst of each season. Etobicoke owners and managers can expect cutting edge flat or pitched industrial roofing. 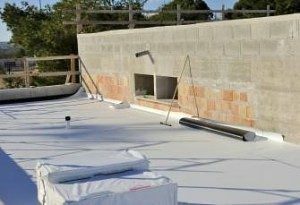 We work with premium suppliers to provide you with roofing that is affordable, expertly and quickly installed and also energy efficient and environmentally conscientious.